The café—once a Vietnamese diner, now a quaint American breakfast spot—sits on the northeast corner of Berry and North 9th Street. Without question, a scone and coffee must start your experience. The lemon poppy seed scone was my choice on this particular visit. Though it's lacquered with a sugary coating, the scone had a moist center. When you've breached the barrier, you'll find small dark poppy seeds and tiny lemon zest shavings. The strong, full-bodied Americano will make you feel alive with each sip, especially after a long night. Fortunately, the day I visited they were offering a chilaquiles special. The traditional Mexican dish arrived in a hot skillet covered in queso fresco and two over easy eggs. Fried corn tortillas were buried among onions, shredded pork, salsa verde, and ample spices. But he breakfast sandwich proved to be the true star of the day. 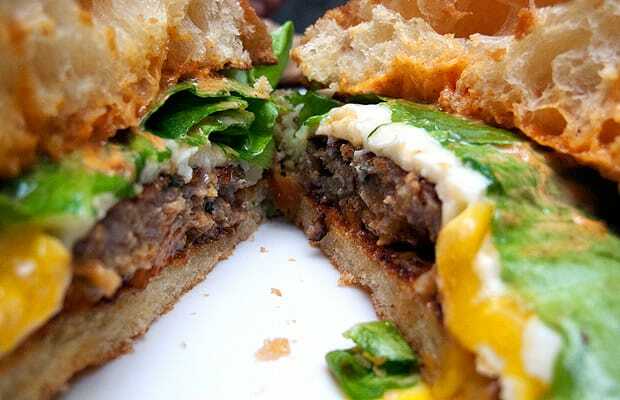 Between a buttery brioche bun, fluffy and soft, the diner will find two fried eggs, cheddar cheese, smoked paprika aioli, lettuce, and a mind-blowing sage sausage patty. Though the patty is smaller than the lettuce and egg, the flavor is strong. The smoked paprika aioli spread provides a powerful sweetness that complements the saltiness of the meat.